Commander José Aguire loves the life of an explorer, but now is swept up in a conspiracy that threatens everything he believes in. One thing the conspirators didn’t count on was accidentally discovering an alien civilization while running from their own. 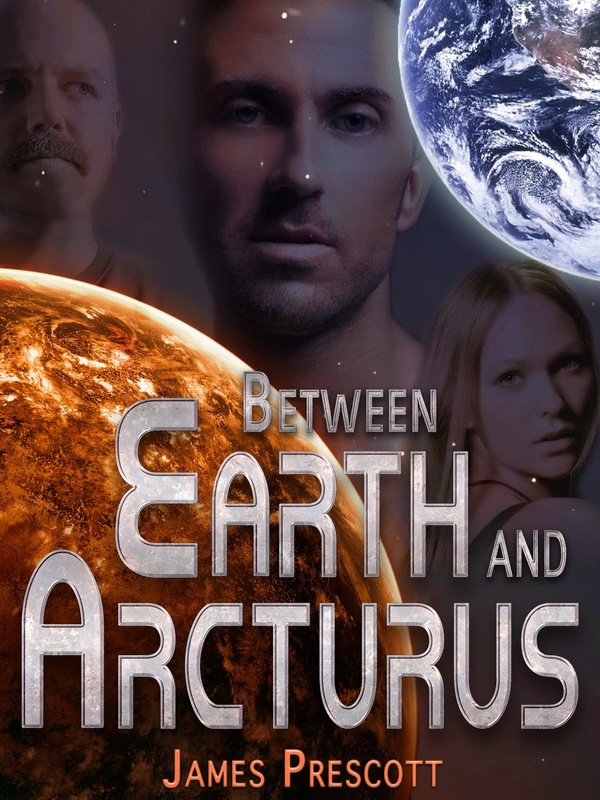 Read BETWEEN EARTH AND ARCTURUS, the science fiction adventure that begins in the 28th century when mankind has ventured into space again, centuries after a disaster almost ended all life on Earth. Click on the menu below to find a link to the episode list. For descriptions of each episode, check out my Show Notes at the top of the page. This is a work of fiction. Any similarity to real people or events is purely coincidental. WARNING: Some of the language may be offensive, but no worse than you would expect in an R rated movie. Special thanks to NASA for the image of the galaxy. Navy Admiral Wolfgang Higgs watched the Exploration Corps admiral strut through the West Point spaceport. He enjoyed watching people and figuring them out. He now understood it was his own vanity that misled him about his protégé, a perverse dolt like Gary Fisher can only rise so high before he can no longer keep up with real leaders. Fisher was as high as he could ever get, and perhaps too high. “Admiral Fisher,” Higgs called out from the cocktail lounge where he waited. Fisher came into the lounge with that toothy smile of his. He was a reasonably handsome man, twelve years younger than Higgs, and looked excellent in an admiral’s uniform. Higgs was jealous. When Higgs was given his position after the coup, he had to get a uniform made for his extra-large girth and always felt he didn’t look military enough. The dolt nodded several times with a raised-eyebrow ‘oh, yes, of course’ expression, meaning he didn’t have a clue what they should talk about. If it had been anybody else, Higgs would offer him a drink and chat for a bit before going downtown, but he’d chatted with Fisher before and saw no need to try it again. He pushed away his half-finished whiskey and dropped a generous tip on the table. They went out to Higgs’s waiting car. Higgs put it in the simplest terms possible. It was a risky thing to admit while—after forty years—most of the world still despised the Corporate State and would willingly fight another war to stop it from coming back. Higgs was a scholar of history and understood where things had gone wrong. It would be done better this time, and would only be an intermediate step leading to an even better, perfect system that will last forever. It was his dream. There was actually a lot more to it, but he wasn’t about to start educating Fisher on the finer points of designing a new society, especially because Fisher wouldn’t fit into the new society. What Fisher would fit into were some nasty plans Batastia had going, many of which Higgs wished weren’t necessary. While they talked about expanding the responsibilities of Fisher’s department to deal with political issues, the car slowed to pass through the warehouse district. Higgs chose this route to see Fisher’s reaction. This was the response Higgs had hoped for. A waifish girl of perhaps fourteen years carried a basket of fruit for sale. A faded yellow skirt and a ragged, oversized shirt hung on lean, wiry limbs that came from walking miles each day in her homemade sandals. Her face was innocent, pretty, and friendly. They discussed his concerns until arriving at the Capitol. Before the Great Disaster there was a university about 400 kilometers northeast of the old United States capitol. Through the perseverance of the faculty and students, the school survived the worldwide calamity, becoming a center of law and order for the region as nation-states began to reappear in the twenty-fourth century. Today, it was the capital city of Earth and, essentially, the galaxy. The Capitol building was originally made of stone blocks taken from ancient ruins, but was gradually remodeled with modern materials and white columns and gabled windows: A grand mansion. Statues from before The Disaster decorated the north and west gardens like a macabre tribute to an almost mythical era. Monuments from modern times lined the avenue leading from the public entrance on the south side. Admiral Higgs was deep in thought as they walked through the rose garden to the main building. Fisher gawked like a tourist at the elegance of the place until they met an attractive young woman who directed them to the elevator. Higgs watched with veiled amusement as Fisher blushed scarlet. Fisher briefly met Vincent Batastia once, but this was his first visit to the office of the most powerful man in the galaxy. Higgs explained to Fisher just after the coup that vice presidents were almost never assassinated. Therefore, it was prudent to have an expendable figurehead while leaving the real power in more capable hands. The right hands. Batastia’s hands. The New Federation’s president, Arnold Garane, was once a professional actor. The press adored him, at least for the moment, but the real power was Vincent Batastia, a man virtually unknown to most people until recently. He was the center of the Inner Circle, a discrete group of businessmen that Higgs was part of and Fisher aspired to join. Higgs worked for TerraPharm as a drug industry lobbyist when Batastia recruited him for something he’d always dreamed of doing: rebuilding civilization into a perfectly designed empire that would last forever. Batastia had a persuasive, old-fashioned charm that spoke of generations of wisdom distilled into a patriarchal figure of bold vision which touched Higgs’s yearning for great achievements. Only the rarest of men at the right moment in history could lead mankind away from the shortsighted policies that keep the human race from becoming gods. The time was now and, Higgs believed, Vincent Batastia was such a man. His belief in Batastia was eroding, however. It started with the plan to take over the government. They looked at every possibility and simply couldn’t find a way that didn’t require the deaths of not only the old government leaders, but also hundreds of innocent people. After it actually happened, the body count turned out to be nearly five thousand. It weighed heavily on Higgs, but he became more comfortable with it as he settled into his new position. What still disturbed him was that it never seemed to bother the original members of the Inner Circle. Such men were in today’s meeting. Batastia himself led the meeting from his gigantic, polished walnut desk. Attorney General Alexei Volk stood slouching by the window with his hands in his pockets, half turned so he could watch the room with his left eye and look outside with the other. Volk was a predator. Chief of Staff Heinrich “Crush” Skor sat at Batastia’s right hand. He had a shaved head with old scars, and he never smiled. When Higgs first tried to find out more about the man, he ran into a dead end. Skor had no past except for being Batastia’s long-time acquaintance. No one ever talked about how he got the nickname, but Higgs knew ‘Crush’ kept a sledgehammer in his office. The Secretary of the Treasury, like Higgs, was recruited from private industry. “And here is our Admiral Fisher, our hero.” Batastia turned his dark eyes toward Fisher who was grinning like an idiot. The words were accurate enough—Fisher received a medal for discovering the time and location where the previous government could be ambushed—but Higgs detected a subtle disdain in how Batastia said it. The Secretary of State, another long-time friend of Batastia’s, came in with his nineteen year old son who was being groomed for some future position. A general—the new head of the Army—followed them. Some referred to him as Higgs’s counterpart, which Higgs graciously tolerated. There would be no public record of this meeting. Official meetings were with President Garane and resulted in nothing beyond good press, which also had its value. Four more politicos arrived and the business of building a new world began. First on the agenda was money. The Secretary of the Treasury gave a good overview on the distribution of the planet’s wealth, with suggestions on how to get hold of a lot of it. This dovetailed nicely with a discussion on corporations. “Precisely the point I made in my master’s thesis,” Higgs agreed with delight. He saw the flicker of offense on Batastia’s face, and furiously backpedaled. Higgs was flustered—not quite sure what just happened—but, consummate actor that he was, managed to smile and bow his head as if accepting a gift from his patriarch. He looked at Fisher, expecting the man to say something intelligent, but was disappointed. Fisher was out of his league, overawed by the figures of power and authority that surrounded him. “Yes, t-that’s right. I have a report.” He opened the envelope and pulled out a sheaf of papers. Fisher fought the urge to squirm when all eyes turned to him in expectation. “Fatal energy fields?” Batastia asked with his eyebrows raised, forming an upside-down V shape in the middle of his forehead and producing lots of wrinkles above them. “So, they might go somewhere, and survive, but they could not return.” It was not a question. His audience gravely nodded in agreement, and Higgs warily nodded with them, suspecting he was about to witness one of Batastia’s brilliant moments. “How’s our list coming along?” Batastia looked to Volk. The blacklist didn’t officially exist, of course. It never officially exists, but every respectable bureaucracy had to have one. All eyes turned to Alexei Volk. The Attorney General shrugged and leaned on the wall. The Exploration Corps had personnel spread across the galaxy when the old Federation fell, and those on the blacklist were not reassigned outside the Solar System after returning from deep space. Batastia kept them close until a way could be found to deal with them, and kept them from joining the renegades who refused to return. Higgs’s idol turned loss into gain but, again, it required killing people who hadn’t actually done anything—they just might do something. He sneaked a quick glance at Fisher, wondering if the man felt any disapproval of such cold-blooded maneuvers. Fisher was gazing at Batastia with glassy-eyed worship, a half-sneer on his pale face. I put a lot of work into creating a twenty-eighth century story about space explorers and the worlds they visit. I feel like I know them, their spaceships, and those worlds.They live and work among the stars. So, I named this site Working The Galaxy. My first novel, BETWEEN EARTH AND ARCTURUS, is available on Amazon for a reasonable price, and for free as an audio podcast beginning with the three part prequel. The Show Notes at the top of this page will take you to the episode guide. Many of the posts here are reviews of other podcasts which, I hope, will help the audio community. Comments on posts are welcome. If you wish to send a private message the address is workingthegalaxy@gmail.com. How does this camera thingy work?